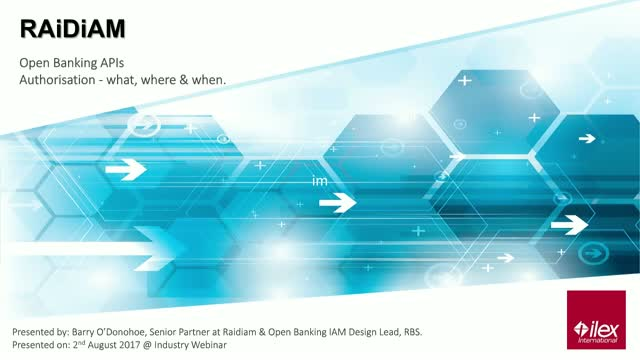 Open Banking APIs: Where, what and when? The webinar will explore the topic of customer consent, its authorisation during an Open Banking API flow from an overall concept, design and implementation perspective. This will cover all main aspects of the security profile and enforcement on an API channel - also from a GDPR perspective. Also explored will be how a policy decision capability could help with fine grained authorisation in the context of an Open Banking / PSD2 API channel. In this webinar, presented by KT Secure in association with Ilex, we will be assessing the role of Identity and Access Management when establishing GDPR. There are countless reasons why an organisation would choose to start an Identity and Access Management (IAM) or Identity and Access Governance (IAG) project. For those starting this journey, one thing is crucial – to be completely transparent about the justifications and objectives for organisational spend. Alongside this, understanding the common pitfalls and practical tips prior to starting your project will add to its success and overall effectiveness. An insight into the core of what we do at Ilex International and how our Identity and Access Management solutions can enhance the security of organisations from board level down. Learn about the latest trends in Identity and Access Management (IAM) with Ilex International. Our webinars and videos aim to educate and inform subscribers on major industry issues related to cyber security, compliance and regulations (including GDPR and Open Banking), access control and identity management. Title: Open Banking APIs: Where, what and when?